Associated Bank, in partnership with the Associated Pride & Equality Exchange (APEX) colleague resource group, celebrated National LGBT Pride Month in June, recognizing the impact that lesbian, gay, bisexual and transgender individuals have had on history as well as in business, both locally and around the world. APEX was created to educate, attract and retain lesbian, gay, bisexual and transgender colleagues and serve as a resource to the communities in which they reside. APEX offers inclusive educational and community involvement activities that promote a culture that respects the diversity of human expression and identity and creates opportunity for all. 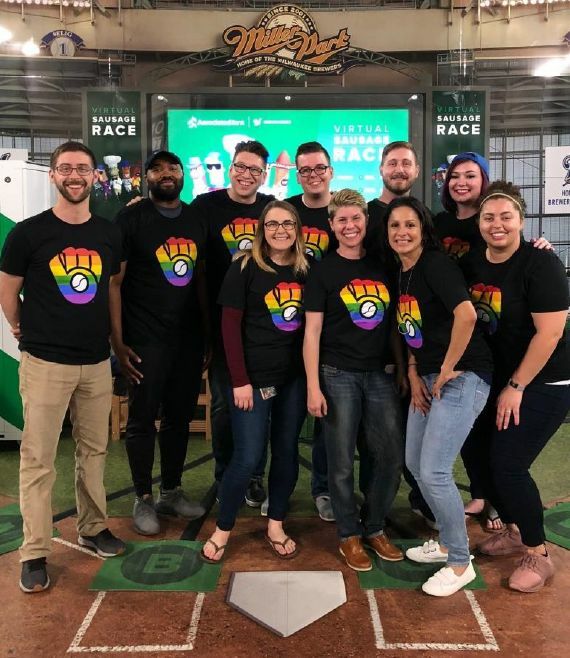 To celebrate the month, Associated Bank colleagues took part in the first-ever Milwaukee Brewers Pride Night at Miller Park on June 21. Attendees received a ticket, courtesy of Associated Bank, to watch the game from the corporate suite. They participated in a pride parade on the field before the game and left with a commemorative Pride Night t-shirt. On June 14, Associated Bank sponsored the Wisconsin LGBT Chamber of Commerce Happy Hour at Great Northern Distilling in Plover, Wis.
Associated Bank Branch Manager Marty Shimko was recognized as a Business of Pride honoree by the Minneapolis/St. Paul Business Journal. Associated Bank colleagues and friends attended Arise + Shine, one of the nation’s largest pride events in downtown Minneapolis on June 24. Funds raised benefited the Arise Project, an organization that supports LGBT homeless youth in the community. Associated Bank encourages employees to become involved in at least one of the six colleague resource groups (CRG) offered. In addition to APEX, the other CRGs are: Associated Veterans Network, Associated Women’s Network, Cultural Awareness Network, Young Professionals of Associated and Associated Forward Abilities Network.